New to Beer? Try My Top Ten Beers! You can (re)start your beer adventure right now by picking something up the next time you head down to the supermarket or your local offy. Once you start, you can’t stop. Take it from someone who knows! 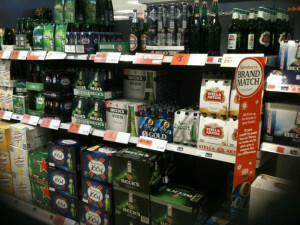 There are of course specialist beer shops all around the country, and online, which sell all manner of incredible beer. I’ll be posting more about some of them very soon, so for now call this YOUR STARTER FOR TEN. And don’t forget to also look out for these Top Ten Beers on draught in a pub too. Of course, you’re more likely to find them if you’re in a pub run by the actually brewery which produces the beer, and you’ll find they are mainly concentrated in the area where the brewery is based. 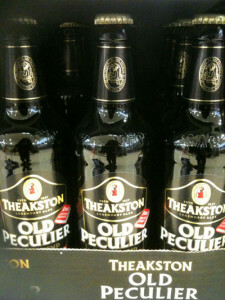 So Fuller’s (London and the SouthEast), Badger Ales (Dorset) or Theakstons (North Yorkshire), you get the picture. There are links to the brewery websites so you can snoop around for a bit more information. Each beer doesn’t seem to sell for any more £2.50 a bottle in bigger shops. So when you get hold of one remember to tweet me or facebook me pics of what you’ve been drinking and what you think of them. PS They are in no particular order. 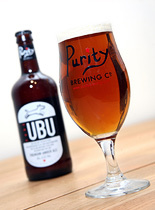 Pure UBU has always been a firm favourite with the ladies at beer parties I’ve thrown in the past. I’ve hosted two chic and fabulous FemAle parties at Birmingham’s Malmaison hotel with the Purity Brewing Co team! This amber-coloured UBU beer has a bit of bite and spice, but isn’t overly so as to put you off, because the bitterness doesn’t seem to linger for very long. It’s extremely drinkable alone, for me there’s a kind of a subtle lychee aroma here which is lovely. You can’t resist the cute drawing of UBU on the bottle, he’s the farm’s dog. What’s exciting is the Purity guys are so cool, they’re doing so well they’re expanding capacity of the brewery, which is on a farm near Stratford-upon-Avon, and they’re planning to release at least one new beer by the end of this year. 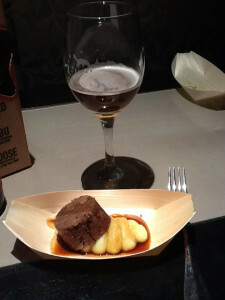 Pure UBU with Braised Beer served at my 2012 FemAle party! Nom nom nom! 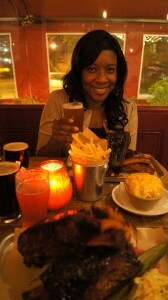 Beer and Food match? It’s super with roast beef (but don’t go mad overpowering it with horseradish sauce though), more of something like tender slices of pot-roasted brisket. Why not tip some UBU into the pot as the stock to cook it in. Corrrrrrrrr! It’s definitely golden and in a clear bottle, which scares me a little. Why? Keep reading. 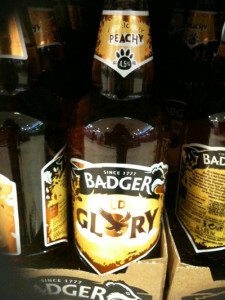 When Golden Glory is tasting great – you should get the melon and peach aromas and flavours in this beer in a subtle and pleasing kind of way. But a clear bottle makes a beer more open to risk of ‘light strike’ – sunlight hitting the bottle and affecting the taste of the beer and making it smell and taste a bit like baby sick. (Yak!). Lighstrike is difficult to avoid in beers which are in clear bottles (that’s why most beers will be in dark brown or green bottles). Truth is you’re never going to know for sure how the beer is stored after it’s left the brewery and hits the shops. It might be well kept in a cool, dark cupboard until you take it home or be sat outside on a sunbathed loading bay all day. Basically it’s pot luck. And then you’ve got to avoid leaving it on a sunny shelf when you get it home. So when you open and smell the beer you’ll know it ain’t right. Tasting it will probably confirm your suspicions! Apart from those pitfalls, this beer is lush. Beer and Food match?This beer is light and refreshing, so I’d pair it with the lightest of dishes. 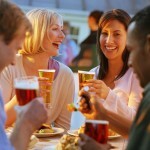 Nothing too loud in terms of flavour, so as not to disrupt the flavour of the beer or the food. I’d say Pan-fried Sea Bass with creamed potatoes and buttered spinach. This way you don’t lose any of the peachiness in the beer’s flavour and you get the best of both worlds, creamy potato and butteriness too. I heart this beer! The brewery’s named after an American revolutionary who fought for independence, 6 generations of one family have been making beer. 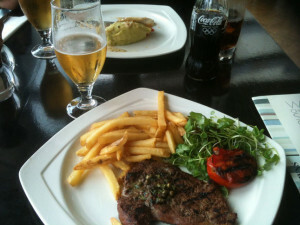 Here’s the mean and moody shot from Le Truc restaurant in Birmingham city centre when I first drank it. This beer is so lemony, fresh and refreshing and smooth in the mouth that it tempered the pepper from my peppercorn sauce on my TGI’s steak. Utterly delicious with food or without!! 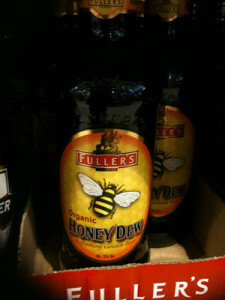 A ridiculously versatile beer made with Organic honey at London’s largest and oldest independent brewery, Fuller’s. They are too cool for school and IMO make phenomenal beers! 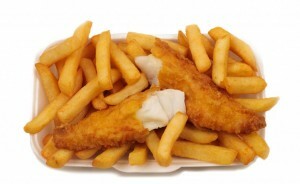 I sometimes quaff Honeydew with cod and chips from my fabulous local chippy. The beer doesn’t overpower the cod, and its lush sweetness contrasts fabulously with the lashings of vinegar and salt. 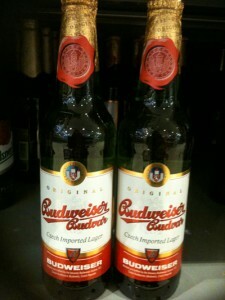 Budvar is one of the finest examples of a pilsner. It’s brewed in the Czech Republic two hours from Prague in a cute town called Ceske Budejovice. 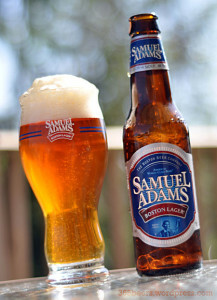 The Pilsner lager style of beer is most popular style us Brits drink nowadays. And if you’re tired of the Carlings, Fosters and Becks of this world, then you should really give your taste buds an upgrade and buy yourself a Budvar instead! Golden, refreshing, with a digestive-biscuity smell and taste, with a little bit of grassiness too, and a marked bitterness that – for me – is very bearable, Budvar is tasty. It’s matured for 90 days which deepens the flavour and makes it clean and crisp. Yum! The bitterness doesn’t catch the back of your throat in the way some beers do. I’ve visited the place where it’s brewed and met the man who brews it. An awesome place. Check out my video here!! When in Ceske Budejovice last October, I ate a lot of fab local food with my Budvar. 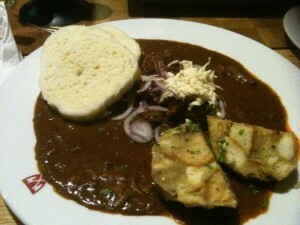 My fave dish was Beef Goulash and Bread Dumplings. The beer cut through the rich, thick beef sauce and lifted the sticky dumplings off my tongue and off the roof of my mouth with ease. So much so, I must have wolfed the whole combination down in less than 10 minutes (Burp! Oops!). This beer is a wonderful complement with any rich, hearty, meat-based dishes like this. Why not try it with a traditional British beef stew? 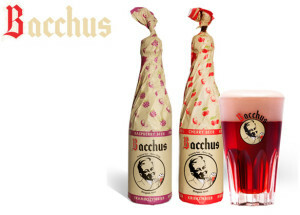 Frambozen is a Belgian brewed sour, raspberry beer for all you fruit beer addicts out there. A lip-smacking combination of sour and sharp, but it’s also refreshing and rather sweet. It looks great, coming wrapped in paper and rather luxurious. I have this very occasionally as something of a treat! Beer and food match? At one of my elegant beer parties this beer went down a storm with Dark Chocolate Delice (read about it here, COURSE FIVE). It also rocks rather surprisingly with Thai Sweet Chilli Chicken and Stir-Fried Egg Noodles. The sweetness in the chilli sauce putting a lid on that sweet beer and its ‘sharp-intake of breath’ sourness too! Let Old Peculier banish your fear of the dark beer. It’s got a fruity tone to it that makes me think of cherries and blackcurrants, with a hint of burnt brazil nuts about it, but not unpleasant. You could ramp it up and match it with something rich, equally dark and sweet like Duck in Plum Sauce, the sweet, fruit gloopiness complementing all those flavours in the beer. 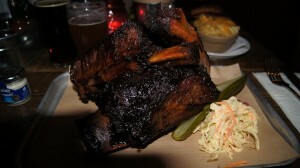 Or BBQ ribs in a thick gooey treacley glaze (like the lush ribs served at Duke’s Joint in Hackney). The sauce diverting the drink’s sweetness and heightening the bitterness a little but retaining that nuttiness. This beer rocks! 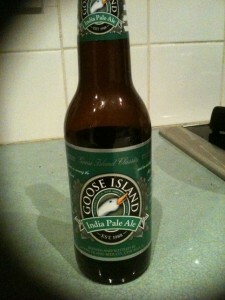 It’s an ‘India Pale Ale’style of beer. 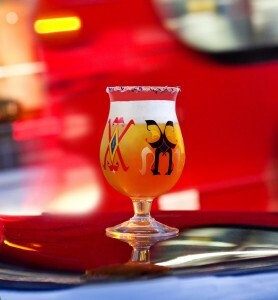 I love IPAs – it’s the style of beer which was brewed in London in the 19th Century. It was shipped out to the aristocrats in Bombay and Calcutta at the time and became incredibly popular, with a booming trade. British breweries brew the style still and the Americans love IPAs just as much as we do. 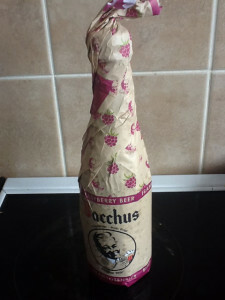 In fact, there’s quite a fashion for brewing ‘crazy’ IPAs which are stonkingly fruity and intensely bitter at the same time. This Goose Island IPA though is a little more gentle than those sort of big flavour hitters, and I think this beer is a terrific way to get your started on your IPA journey. The grapefruit and pineapple aroma on the nose combined with a silky smoothness in the mouth make this beer easy drinking, as I find it doesn’t taste as strong as I’d expect a 5.9% beer to be. I enjoyed this with some hot roast chicken thighs the other night for tea, alongside some creamy coleslaw and some warm buttered slices of French baton. The beer’s creaminess complemented the butter on my bread and the juicy, fatty chicken skin, while the beer’s fruitiness danced alongside the sweet carrot and cabbage in my coleslaw. 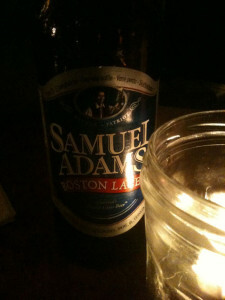 And, as most beers do, it cleansed the fat off my tongue and got me ready for another forkful. 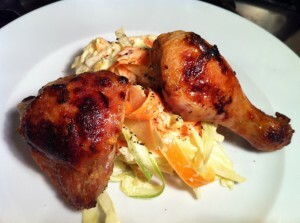 Cheers to fab foodie and recipe raconteur – Reluctant House Dad for this pic of one his new creations: Buttermilk Baked Chicken with Fennel and Apple Slaw! I reckon that would go down swimmingly with this beer too. Nom nom nom! Brewed in small batches in Edinburgh, this beer was apparently born by accident. Check out the story on their website. It’s a beer aged in oak whisky barrels so the drink has soaked up all the cheeky woodiness and strong boozy flavours from the barrel. The beer’s matured for 77 days to give it depth of flavour. 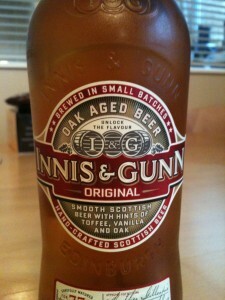 This I&G original turns out sweet with some toffee & vanilla aroma and flavours coming out as well. Make no mistake this is a heady beer, best drunk with food. 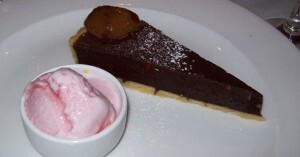 I’d dive headlong into a Sticky Toffee Pudding and some thick devon custard with this one. Sweetness in the beer will temper the sweetness in that sticky sauce, but not eliminate it completely. The creamy beer complements that thick custard and you’ll be left with those lush vanilla flavours in your mouth. Or even a Banana Bread Pudding with Hot Caramel Sauce – it’s a special recipe I devised which is in the brand new and very brilliant beer and food matching book created by Thornbridge Brewery and Brew Kitchen, called Craft Union. But, if you’re wanting a savoury kick, a crazily creamy mature cheese, like some deep blue vein Stilton, would sit well with this beer. 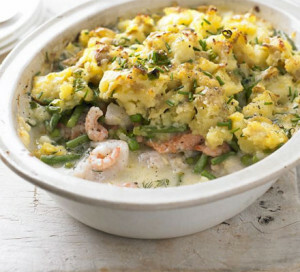 Chunks of it alongside some salty biscuits would help it all go down a treat. 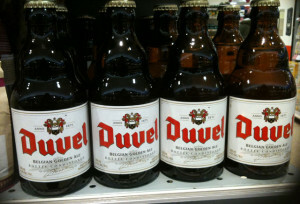 Duvel is quite frankly a corker. The word means devil in Belgian and at 8.5%, it needs treating with respect because there is a little whirlwind of a devil of a drink inside this bottle 😉 It is not, repeat NOT, a beer to be necked in 5 minutes. If you do, you are liable to crash to the floor and hurt yourself badly, as well as anyone else within close proximity. So what do you get when you smell the beer? Sweet Golden Delicious apples on the nose for me. It’s an attractive blonde, beer with a fluffy white head when poured correctly. Crisp, lipsmackingly refreshing, with also a kind of bready smell and something lemony about it too. 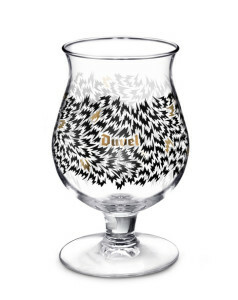 Duvel Cocktail created for London Fashion Week 2013! The creaminess in the mouth about this beer makes me think of heaps of fluffy buttered mashed potatoes all piled on top of rich seafood prawns, mussels, scallops and crabmeat languishing in lashings of thick creamy sauce, nestled amongst fine green beans. I think I’ve died and gone to heaven. SO WHAT ARE YOU WAITING FOR? GO BUY SOME BEER! 15 Responses to New to Beer? Try My Top Ten Beers! Wow Fantastic list, love a pint of Utterly bloody useless , and 2 quality US beers as well !!. Does that what UBU renders you, Iain? lol! Cheers for the comments. Glad you like it. It’s all about suggesting beers for people starting out. Will move on to other suggestions as the weeks and months go on. All the best! Great list, nice choices. Could I recommend . 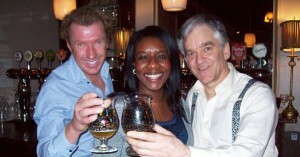 . .
and of course Timothy Taylor’s Landlord. Hey I love Landlord and Old Tom!! I had Black Sheep Bitter when I went to the Shoulder of Mutton up in NYorks for the Aex The Beer tax Video (http://www.youtube.com/watch?v=95Sw_HEfKLo&feature=youtu.be). I’m more a fan of that than the Riggwelter. Not tried Bradfield yet but will look out for it. Thanks, mate!! Hope you all like ’em. Hi Gary, cheers for commenting. Loving the fact you’ve got your own Top 10 recommendations too. I do love me a bit of Leffe Blonde too and Fraoch for that matter. 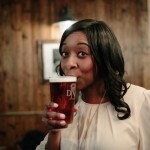 I took that on Live With Gabby on Channel 5 last year – both she and Matt Cardle absolutely loved the beer. The guys from the brewery are very cool too Keep drinking good beer! And thanks once again! So glad Goose Island is in there though, it’s an absolute class introduction to anyone who’s uncertain about trying beer from the USA. Once again a great article. Some of my favorites : Tongerlo Prior, Adelardus Double, Postel Tripel, Corsendonk Agnus. Yes, yes I’m a triple lover ;).